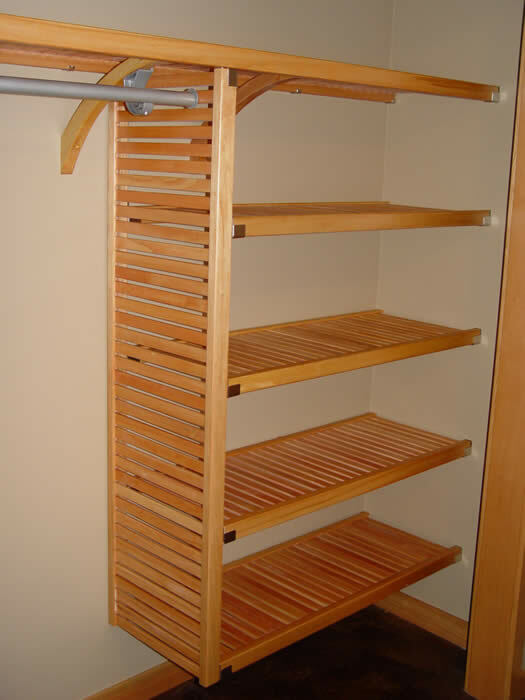 With a little ingenuity, the John Louis Home closet shelving can be used in many different ways. We have designed and installed numerous closets with irregular shapes and obstructions that require modifications to a standard installation. The beauty of the John Louis Home shelving is that it can be cut to any shape and the hardware can be used in different ways. This allows you more flexibily in your designs, so usually all of your client's requests can be met. This entrance closet is situated beneath a stairwell. 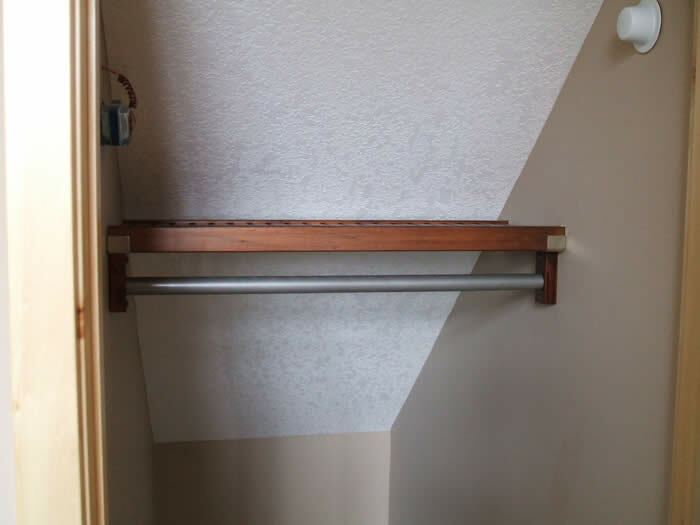 With the back wall being too low to fix the shelving against it and the sloping ceiling, our client did not think this space could be used to hang clothing. However, because of the relatively short span, we fixed the shelving to the sidewalls using the shelf end brackets. Then, using a short piece of a shelf rail we positioned it vertically behind the front rail, after drilling out a 11/4" hole. This hole secured the garment rod perfectly. 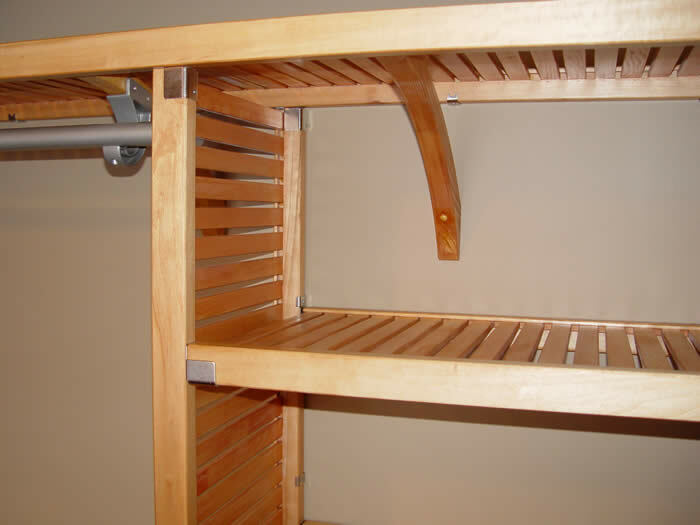 After plugging the drill holes with mushroom caps and using touch-up stain on the cut ends, this space became very functional for storage and hanging clothing. Angled sidewalls do present a challenge, but these be handled as well. Look closely at the left wall in this linen closet and you will see that the sidewall is built at an angle.... this angle was 7degrees. By cutting the shelving at this angle, some of the slat was lost but the shelf still fit snug against the wall. 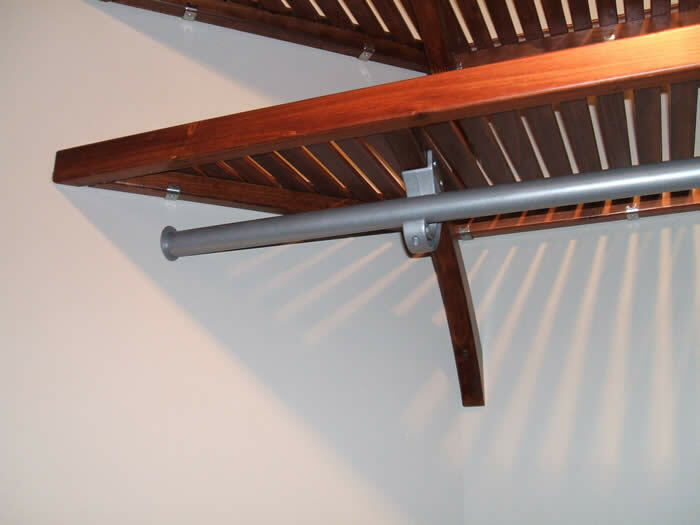 At these shallow angles, perhaps one of the slats will be lost but the standard John Louis installation techniques and hardware can still be used. This sidewall was angled at 45 degrees and needed a little more work. By cutting the shelving at a 45 degree mitre, the shelving slats are unsupported at the back. So, to support these cut ends, we used a small length of the front or back rail of the shelf and cut out the groove which normally support the slats. 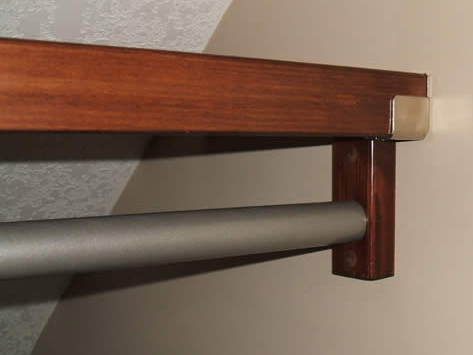 The lower section of this cut rail was fastened to the front and back rails of the shelf with screws and the slats were glued to the top of this cut rail. John Louis Home L-clips were then used to support the lower section of this cut rail to the sidewall. Finally, the top section of the rail that had been earlier cut away, was glued down to the top of the cut slats. This provided an incredible, finished top edge. Where a vertical divider is desired to separate areas of the closet, the John Louis Home Shelving can be used in this orientation as well. 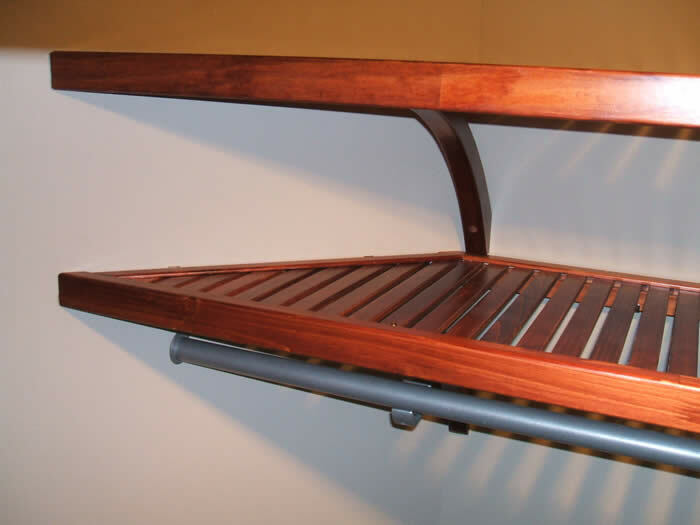 The shelf end brackets can be used to connect the top of the vertical panel to the underside of the horizontal shelf. On the wall, the JLH vertical clips or L-clips can be used to connect to the wall. With this vertical panel now in place, it provides a solid support for other horizontal shelving. 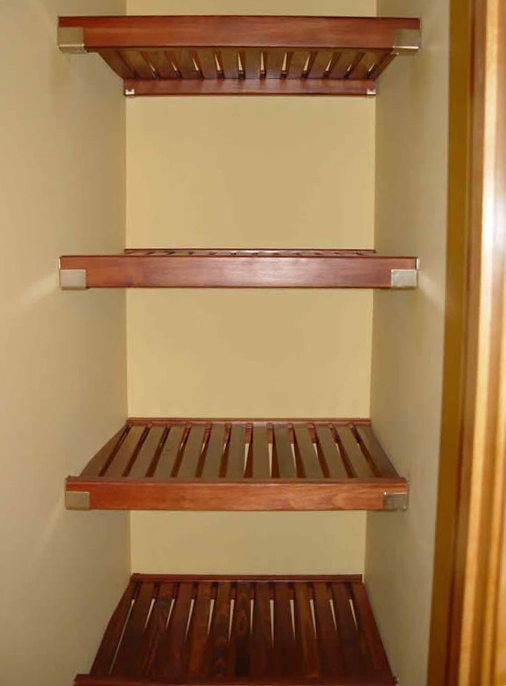 "Our custom closets, usingÂ the Enlightened Organizing system, are amazing!Â Â Sally's expert designÂ abilities have inabled us to Â increase our closet space by 50%.Â Â The service andÂ workmanship provided by Sally and Curtis was outstanding.Â WeÂ highly recommend this company."